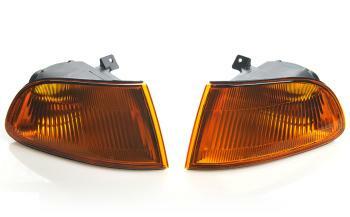 Password JDM Amber Corner Lights HONDA - Lightning Motorsports - Selling Speed since 1996 ! Another PasswordJDM exclusive!!! For all the fellas who knows what cool is, we had to make these available. The Password:JDM Regular Amber Corner Lights are the best there is. Compare these to anything else available, you will know that ours are built to much much higher standards all because we’re PasswordJDM. These are amber straight from the factory. We dont paint these, or get them painted at all, it’s all in the mfg. process. It costs us a bit more, but hell yeah it was worth it. Made to the exact specifications as the OE since they are mfg. by the famous OE lamp supplier that we’ve been in cahoots with for quite some time. lets face it, PASSWORDJDM has more OE lights than anyone else around. All of our regular amber corner lamps are molded with our new PASSWORD Pcircle logo all because we can.